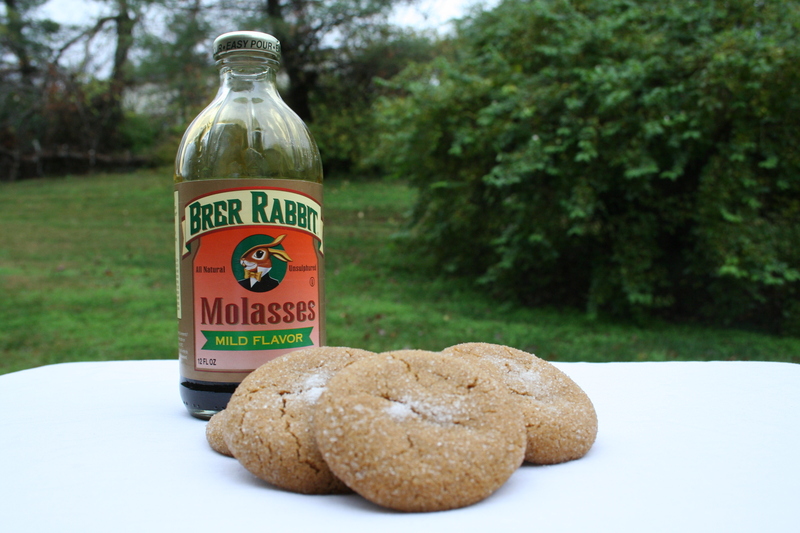 No-Fail Molasses Cookies – Gluten Free! Whenever I need to bake something that is quick and will be a crowd pleaser, I always fall back on my No-Fail Molasses Cookies. I’ve posted my once closely guarded recipe here before. But I can’t share these fabulous cookies with my gluten sensitive friends. So I decided maybe I should experiment with trying to convert the recipe. I’ve baked gluten free before. And this is a fairly simple recipe, I figured I’d give it a try! I clicked on 3 links did a little research online about converting baking recipes and took a stab in the dark. Whoa, on my first try I actually have an edible product. It’s not exactly like the original version of the cookies, but it’s a damn good substitute! So I made these just in time for my gluten sensitive friend’s birthday and shipped them to her. Mix all ingredients until fully incorporated. It will be a sticky gooey batter, a little stiffer than brownie mix for example. Scoop out a chunk of dough and roll into a 1″ ball in your hands. Then roll the dough ball in sugar, coating evenly. Place on cookie sheet covered with parchment paper about 2″ apart. Bake for 10-12 minutes (12-14 for airbake cookie sheets). After about 1/2 time, rotate cookie sheet and sprinkle extra sugar on top of cookies. Do not overbake the cookies, they will get really hard if you do. The cookies will flatten out when they’re ready and be slightly stiff on the edges, but soft in the middle. Allow to cool a couple minutes on the cookie sheet before transfering to wire cooling rack. I like to add extra salt, cinnamon, and ginger to the recipe to taste. An extra pinch of salt or two gives it a nice sweet and salty taste. I also like to add nutmeg and some all spice if I have it. The cookies will continue to bake a while on the cookie sheet after you remove from the oven. Keep this in mind since you take them out a little underdone, but also don’t leave them on too long or they will get crispy. Let the cookie sheet cool a little between batches for a more even batch. I alternate cookie sheets to allow for this. This mixture is much stickier and more gooey than the original version. I found it was best to put a little bit of sugar in my palm while I try to roll it into a ball to get it into a ball and not stuck to my hand. Then I rolled it in the sugar. I found that if I let the batter sit a few minutes after mixing it didn’t stick to my hands as much. The cookies will flatten out to thin cookies, so allow enough room between the cookies to spread. Also don’t worry if the balls aren’t exactly round, they will flatten out perfectly. I’m in the heaviest load of my training for my first Half Ironman. I make a lot of jokes about training and eating, but I love food. No seriously I really love food. Partly why I exercise so much is so I can eat all the delicious things the world of gastronomy has to offer. But the cycle is vicious, because when I train at these extraordinarily high volumes (burning twice my daily caloric intake in one workout at times!) I find myself needing to eat extraordinarily high volumes as well. Seriously, you might be appalled at the tonnage of food this petite redhead can put away. Often triathletes are accused of “hoovering” their food, it’s not pretty. All jokes aside, I do need to make sure I’m getting enough calories, especially protein for muscles and sustained energy, throughout the day to get me through to the next workout. 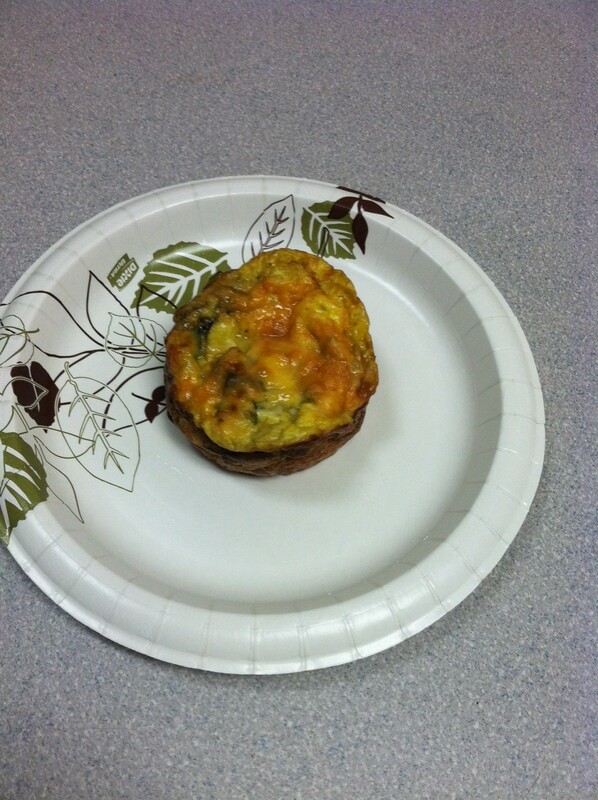 I started making these “Egg Muffins” a couple years ago when I was working a flex schedule, arriving at the office at 6:30am, working 10-11 hours, and running or working out at lunch. I needed something that would give me enough calories to get through the long morning. I’ve become addicted since then. 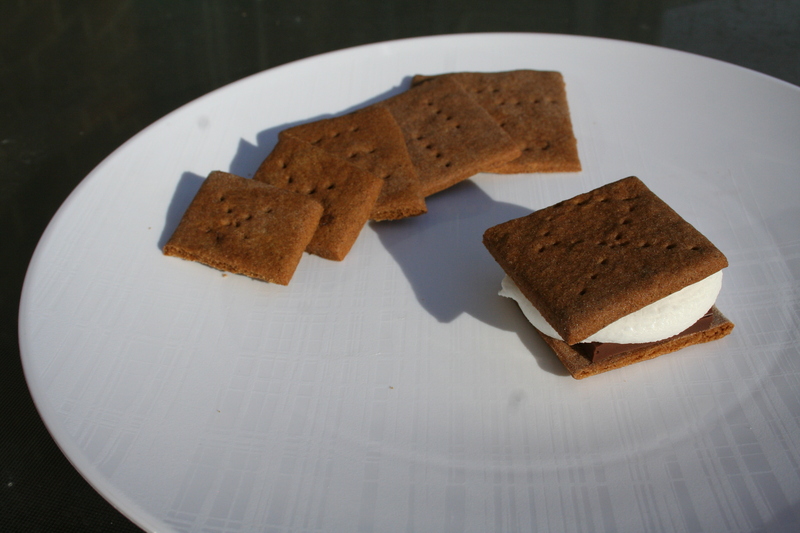 They’re very easy to make, don’t require a lot of special ingredients, portable, and very satisfying. Best part, you make 1-2 weeks worth in advance! I pack them in my lunch and eat them at work, or as a quick protein snack on the go any other time! Crack eggs in a large bowl. Season with salt and pepper to taste. 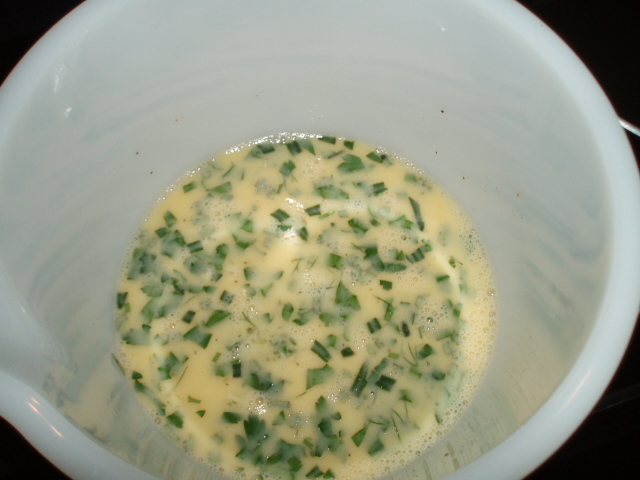 Add milk or whatever you usually add to scrambled eggs. Whisk eggs thoroughly. Add mixers. Add cheese mixers if you like. Mix well. Grease muffin cups if they are not nonstick. 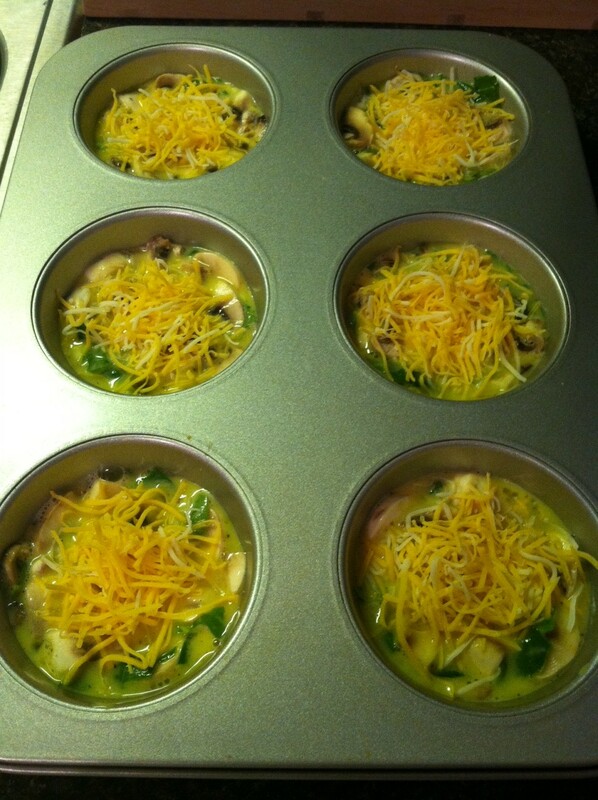 Pour or ladle eggs into muffin cups about 2/3 full. Top with extra mixers or cheese mixers. Bake 25-30min. The muffins will puff up as you bake them. When time is up and they appear to be puffed, turn off the oven. But leave the muffins in the oven to cool down with the oven!! If you take them out and let them cool at room temperature, they will sink in the middle. Once cooled enough to handle the tin, remove from oven and allow to cool before storing. To reheat: Microwave for 30-60 seconds depending on microwave strength. Storage: Muffins can be stored in containers or sandwich bags in fridge for 1-2 weeks. They can be frozen for quite a good bit of time too. I do recommend allowing them to thoroughly cool before freezing to avoid any frozen condensation and allowing to thaw before reheating to prevent extra moisture. Muffin tins: I prefer the oversized tin with 6 cups instead of 12 for larger muffins. But when I’m not in heavy training, I use the 12 smaller ones instead. Eggs: I pick 10 eggs because it’s not quite 2 eggs per each muffin (it’s actually 1 2/3), but any amount will do. Decide how much or little protein you want and go crazy! Mixers: Don’t over think this. I take stock of whatever I have in my fridge/pantry that needs to be used. 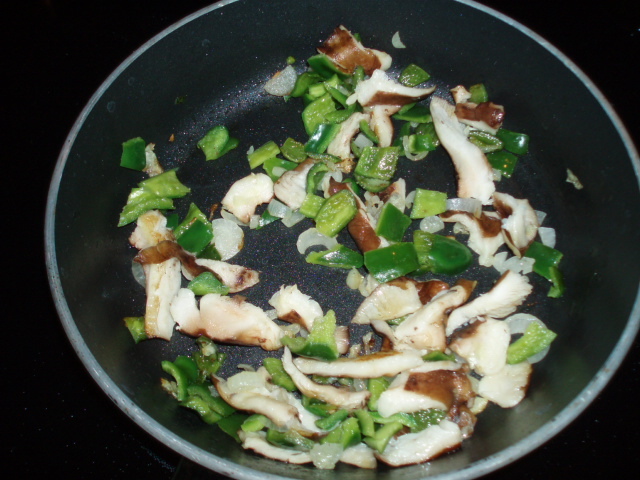 I love mushrooms so I usually cut up mushrooms very small and add them. If I have spinach on hand I add that for the potassium, just tear it up into tiny pieces. The key is adding everything finely chopped so it distributes evenly. Fresh herbs from the garden are lovely in the summer, or any other kind of seasoning you like. You can also forego mixers and go natural. I like regular egg muffins too. Also, sometimes I wait to add the mixers until after I’ve put the egg mixture into the tins. There is no wrong way to do this! Cheese mixers: I just check what I have on hand in the fridge. Then I sprinkle, cut up, grate, dollop whatever cheese or combination of cheeses I want into the mixture/tins. I like to sprinkle some kind of shredded or grated cheese over the top of the muffins so it bakes in on top. Parmesan or regular shredded mozzarella or cheddar is great for this. But also like to cut up chunks of other cheeses like havarti into the eggs. A nice herby goat cheese chevre bakes up lovely too! Not the prettiest food, but so delicious. I have to admit, that before I made threw together this dish, I would have read this recipe and completely turned my nose up at it. But I guess necessity really is the mother of invention. When I have very little time between training and work and sleep, but still need to eat excessive quantities of healthy food I struggle to come up with something that doesn’t take much time, but can serve all my protein, carb, taste, etc fueling needs. Too exhausted and hungry to think hard, I just grabbed the first things I could out of my pantry caveman style. Protein – fish. Carbs – Pasta. Fiber – frozen veggies. Grunt. Cook. Eat. Fully expecting this to be gross, I was prepared to either choke it down or throw it out. But the surprise was that this was actually pretty good, hence the name. 1 bag frozen veggies of your choice, cooked your favorite way. Cook pasta according to directions on box. Drain and return to pot/sauce pan with heat on low to medium. Add Tuna, mixing well and breaking up with fork. 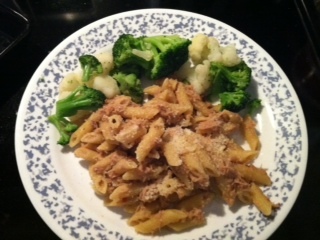 Add Zesty Italian dressing to taste and to help mix the pasta and tuna together. Add some parmesan to taste. Serve with veggies on side (or mixed in with pasta) and top with parmesan. I cannot believe how easy (and fast!) and tasty this was. I was actually craving it the next day. When given the opportunity to participate in the Food Blogger Cookie Swap, I jumped on it! I decided to finally share one of my closely guarded recipes. And although it is a very simple recipe, it is always a crowd pleaser. It is also one of my no-fail recipes. It is really hard to mess up these cookies. They come out looking perfect every time! Mix all ingredients until fully incorporated. It will all stick together in clumps in the bowl. Scoop out a chunk of dough and roll into a 1″ ball in your hands. Then roll the dough ball in sugar, coating evenly. Place on cookie sheet covered with parchment paper about 2″ apart. Bake for 10-12 minutes (12-14 for airbake cookie sheets). After about 1/2 time, rotate cookie sheet and sprinkle extra sugar on top of cookies. Do not overbake the cookies, they will get really hard if you do. Bake until the tops just start to crack open. Remove immediately and transfer to wire cooling rack. I like to add extra salt, cinnamon, and ginger to the recipe to taste. An extra pinch of salt or two gives it a nice sweet and salty taste. This is easily cut in half for about 3-4 dozen cookies. 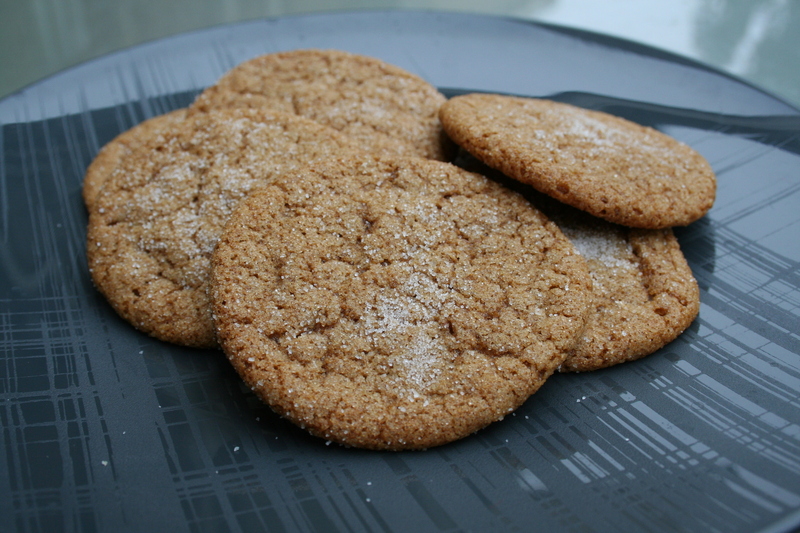 If you overbake, the cookies will get hard like gingersnaps, which you may prefer that texture. But if they get too hard, put them in a container with a slice of apple for a day or so to rehydrate them. Your palms will get a nice exfoliation and moisturizing from the oil and sugar as you wash off the cookie from your hands. Church cookbooks are incredible gems for recipe inspiration. They are usually collections of recipes from the church members for tried and true recipes. It’s like digging into someone’s recipe box. P.S. If you need a Gluten Free version, you can find it here! My garden has really been humming along. Every day I pull off several fruits of my labor, usually cherry tomatoes. No really, every day I have a huge handful! I recently pulled quite the bounty and as it was filling up the shelves in my fridge, I was trying to decide what to do with it all. In particular I had my first shiitake mushrooms I harvested, some poblano peppers, onions, and more cherry tomatoes and herbs than I know what to do with. Hm, how can I get all of those flavors together. An omelette! Little did I know it would turn into an omg, so good moment! I made enough for 2 full servings. I may have eaten the entire thing. All of it. Could not get enough! But I biked 20 miles that morning, so I was replenishing carbs and protein right? Feel free to add other seasonings. I had intentions of using several different kinds, and partly forgot to add them, and partly decided it just didn’t need anything else. The feta and the dill really added so much to really flavor everything. Plus, add in the mild heat of the poblano and the smoky, earthiness of the shiitake and it’s such a surprisingly wonderful complement of flavors! In a very small frying pan, heat a teaspoon of olive oil over med-hi heat. Add the onions, peppers, and mushrooms. (Save the tomatoes until last!) Lower temperature to medium or med-low and continue to cook until mushrooms just start to brown. Do not overcook any of the veggies. In a medium bowl, whisk together the eggs with salt and pepper and add milk just as you would for any omelette or egg dish. Then whisk in the herbs. 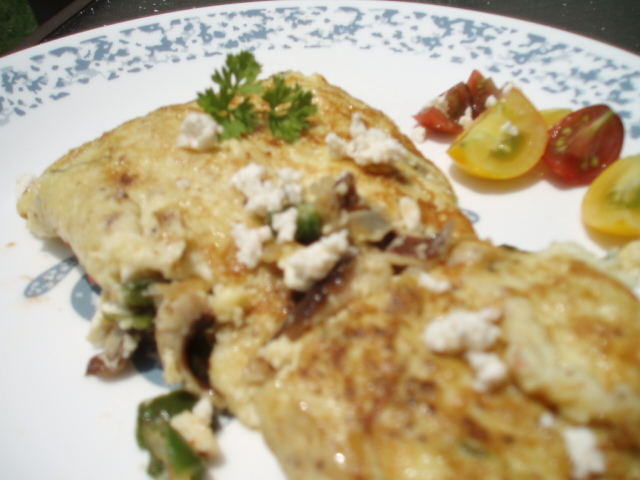 In an omelette pan or medium sized frying pan, heat a couple teaspoons of olive oil over med-hi heat. Add the egg mixture. Watch this carefully, you may need to lower the temperature. You do not want the eggs to cook on the bottom too quickly. 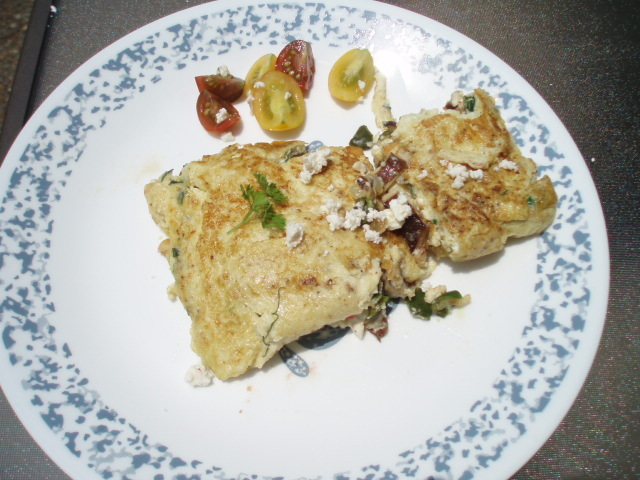 I am not a master omelette maker, so I recommend you google omelette cooking techniques. I certainly made some mistakes this time. Once the omelette is mostly cooked through (will still be a little runny on top), and you are able to slide a spatula around the edges and up under it, place the cooked veggies, the tomatoes, and the cheeses on half of the omelette on the side closest to the handle on the frying pan, adding the cheeses as well. Holding the handle angle the pan downwards and use the spatula to flip the other side over the veggies and cheeses. Allow to cook a little longer and to heat up the veggies and melt the cheese. If you’re really talented you can flip the whole thing over to cook some more on the other side so you don’t get too brown on one side. When cooked to your desired amount, serve with some extra tomatoes and feta on the side. omg so yummy! I’ve been saving up some food posts forever. And I’m just giving in and posting them now. Last weekend I made the best smoothie from scratch. I love smoothies, but they are actually not as healthy as most people think. They’re usually loaded with sugars, calories, fat, protein (adding on more calories), etc. The best way to avoid that is to keep it as simple as possible and make your own. At a smoothie store, you don’t know what they are putting in it, how fresh the fruits are (or if they’re even using real fruit), or what kind of additives and supplements they include. So, keep it simple. Keep it as close to just fruit and ice as you possibly can. Keep in mind a banana can add a lot of body and substance to a smoothie without loading it down with milk and powders. The basic ingredients are ice (duh), fruit (berries work well, but just any soft-ish fruits are great), banana (if you’re so inclined), and then you can add juice or water to make it more liquid and if you’re inclined include some milk/soy milk/or yogurt. For this smoothie, I was in a hurry to run some errands, but needed to eat my morning yogurt, get some other food in me since it was pushing past lunchtime already, and I wanted something cold because let’s face it, July in Nashville = purgatory heat! So this is a great way to do all those things, especially beat the heat. Unfortunately I don’t have a picture of this lovely pink strawberry banana smoothie. It was so delicious, I sipped it down before I could get a picture. Plus you don’t want it to melt right? 1- 4oz. container of strawberry fat free yogurt. In a blender, add 1/2 of the ice, capped strawberries, banana cut into pieces, yogurt, 3/4 cup cider/juice. Pulse to break up ice and blend ingredients. Add more ice and cider to taste and more strawberries if necessary. Tip: Pulsing will break up the ice and move it down to the bottom, rather than leaving it on one setting where the bottom gets blended more than the top and wears out the motor of the blender.